By Aida Skirmantaite | December 3, 2013. Director Francis Lawrence has proved he is invincible after fearlessly taking over Gary Ross’s first instalment of The Hunger Games; making it better, stronger and more enthralling. The sequel of the Hunger Games saga, Catching Fire is indisputably an improvement from the first movie and Francis Lawrence’s genius is to thank for it. It is inevitable to compare the sequel to its predecessor, and the changes are extremely noticeable. For one, the annoyingly shaky camera effect is gone. Secondly, there was no more of that irritatingly long and winding 30-or-so-minutes intro into the action like in the first movie. 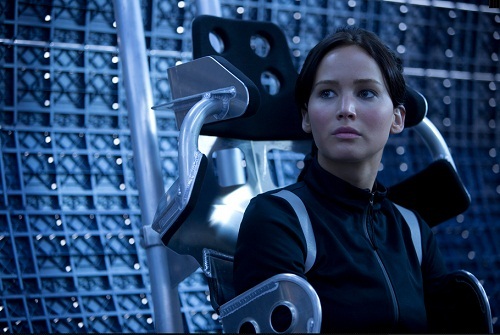 This time the audience was captivated just a few minutes into the film, with live bursting drama and action as President Snow (Donald Sutherland) arrives at Katniss’s (Jennifer Lawrence) doorstep and gives her an ultimatum – either she makes the ‘Capitol Lovers’ act work; or else. After Katniss and Peeta’s (Josh Hutcherson) stunt with the deadly berries at the end of the first movie, which ultimately made them the victors of the 74th Annual Hunger Games, Katniss has caused a stir. Now President Snow must stop it, or he will have a rebellion on his doorstep. So the Capitol Couple have to tour the districts and Katniss is trying extremely hard to make it work. Katniss struggles with this because of her love for Gale (Liam Hemsworth), who is alone back in the District 12, watching the newly brewed love-birds live on the Capitol TV. This time it takes significantly longer for the gruesome Annual Hunger Games to make a comeback in the film, but President Snow makes sure that the 75th Hunger Games (the Quarter Quell) will be unforgettable. Catching Fire runs for almost two and a half hours, though it never drags and at the end of the movie, the viewers are left wanting more, thanks to a cleverly placed cliff-hanger. All in all, it is an extremely well-directed movie with superb actors (we all love Jennifer Lawrence), which paves the way for the next chapter of the Hunger Games saga.